EMC conducted a Green Growth Potential Assessment (GGPA) during 2016-2017 to assist the Government of the Lao PDR (GoL) in formulating its national green growth strategy and support the national administration in policy design and implementation. The project was undertaken for the Global Green Growth Institute (GGGI), which is advising the National Institute for Economic Research in this process. We also worked closely with Dr. John Ward, of the Mekong Region Futures Institute. The GGGI is a treaty-based international, inter-governmental organization dedicated to supporting and promoting strong, inclusive and sustainable economic growth in developing countries and emerging economies. The organization defines green growth as a development approach that seeks to deliver economic growth that is both environmentally sustainable and socially inclusive. Through the green growth model, countries seek opportunities for economic growth that are low carbon and climate resilient, prevent or remediate pollution, and maintain healthy and productive ecosystems, as well as create green jobs, reduce poverty and enhance social inclusion. The GGPA is a diagnostic tool that allows a comprehensive examination of the Lao PDR’s performance and identifies approriate green growth interventions based on a systematic understanding of the country’s key development challenges. 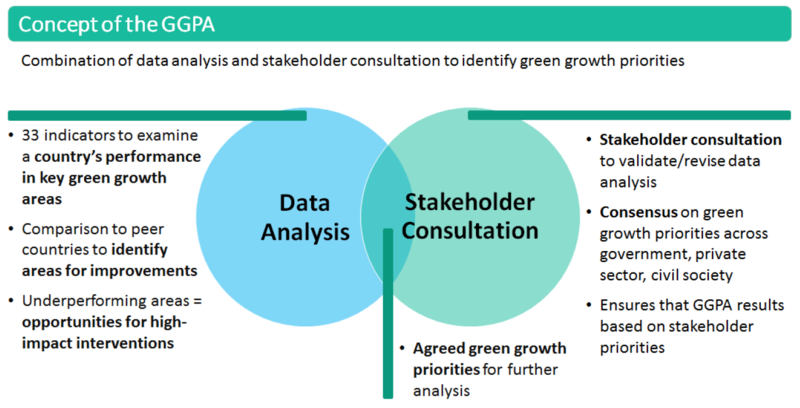 It consists of a combination of data analysis and stakeholder consultation in order to identify and prioritize a country’s opportunities for green growth. (3) climate resilient growth; and (4) socially inclusive growth (see figure). In addition, inputs were gathered from a broad range of stakeholders through an interactive Delphi-based workshop to identify priority areas that offer the highest potential for green growth interventions. As part of the analysis, the Lao PDR was compared to peer countries across a selected range of key indicators. This was followed by interviews with local technical experts to inform the analysis and identify relevant recommendations. The rationale behind this inclusive process is to build the country’s green growth agenda by giving the government and other stakeholders the leading role in the process, as opposed to externally-imposed solutions. The published report presents the process and findings of the Lao PDR GGPA. 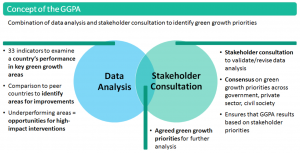 It synthesizes the findings of the initial data analysis and the outcomes of the stakeholder consultation, including priorities and potential entry points identified by the Lao PDR ministries, as well as a series of recommended interventions that contributes to sectoral green growth targets and is aligned with the Lao PDR 8th National Socio-economic Development Plan 2016-2020 (NSEDP). The report identifies the following six sectors as entry points for green growth interventions: agriculture and fisheries; forestry and land use; tourism; urban development and transport; energy and mines; and education. Within these sectors the following five green growth priorities were identified: (1) depletion of natural resources; (2) technological readiness; (3) adaptive capacity to the adverse impacts of climate change; (4) soil health; and (5) agricultural productivity. The recommendations for each sector are based on: (1) the goals set out in the 8th NSEDP; (2) the initiatives set out for the three outcomes highlighted in the 8th NSEDP; and (3) the initiatives suggested during consultation with technical experts. The complete report (135 pages) can be downloaded here, and also a summary report is available here.